This is sort of a sister post to My Aikido Timeline. Here I’ll try to keep track of all the teachers I’ve had the privilege of training under. They are listed starting at the beginning, with most recent additions at the bottom, in order by the first time I trained with each. I will be adding to this post over time. Putting this list together just reminds me of how extraordinarily fortunate I am to have had this breadth of experience. To Present – Hundreds of training days, many workshops, and seminars. May 9, 2009 – My second day of training, and many classes since. May, 2009 to Present – Many classes. May – December 2009 – Various classes (mostly weapons). May, 2009 to Present – Many classes (mostly weapons). Aikido practice should be a joyful experience, and playful most of the time. If you aren’t having fun, you may be treating yourself too seriously. Don’t be in a hurry to master anything. You have the rest of your life to enjoy your training, benefit by it, discover, and grow. True for Aikido training, and for everything. My 2nd kyu Aikido exam, on 21 January, 2012. Many thanks to my mentor and uke, Cyril Poissonnet, 3rd Dan, whose teaching, coaching, and encouragement have been an important and happy part of my Aikido training from the beginning, and to Dave Goldberg Sensei, and all the teachers and students at Aikido of San Diego. It’s been a steady stream of “aha” moments since my exam yesterday. More to come on that soon. Well, fine. I can’t train 6 hours a day and keep up with blogging at the same time. So, here’s a bit of catching up. The seminar was a wonderful experience, with the ouchy exception of some persistent leg muscle spasms that started a couple of weeks ago. I got through most of it, and had a good deal of fun, but was also pretty limited in what I could do, and distracted, which was unfortunate. There were 6 guest instructors in addition to the main 3. Here’s a quick summary of a few of the classes, to the best of my recollection. Troy Farrow Sensei taught on Friday morning. We worked on a variety of swirly techniques from gyakute-dori (cross-hand grab), including one I do all the time in jiyuwaza, but can recall ever seeing anyone teach it. It was a fun, high-energy class, and a great way to get going in the morning. Friday evening’s class was led by Greg O’Conner Sensei, who I had the pleasure of training with at the Aiki Retreat last summer, too. His focus was on movements coming from sword technique, with a lot of cutting energy. Jeff Sodeman Sensei taught a class on injury prevention and safe ukemi on Saturday morning. It was a great one-hour reminder of the things we’d learned in one of his longer workshops last year. I especially liked one warm-up exercise that involved stepping out in 8 directions (to the front, to the front-side, to the side, etc. all the way around), at first a little, then deeper, and finally in lunges. Great for loosening up, and for building strength and coordination. And you can do it any time (while you wait for the coffee to brew, for instance). I finally got to train with George Ledyard Sensei on Saturday evening, which was awesome. His way of communicating and demonstrating really clicks with me. I enjoyed his class, and got a lot out of it. We worked on a Daito Ryu method of learning to send a wave of energy over our partners, from our hara (center), getting inside the attack. It was interesting to play with that same energy later in the seminar, especially in Ikeda Sensei’s class. On Sunday, Lia Suzuki Sensei taught the morning class, but I arrive to late to join in (I really need to warm up first). I’m sorry I missed that one; I’d been looking forward to training with her. Sunday evening’s class was taught by Murashige Sensei. By that time my legs and brain were too tired to participate, so I watched that one from the loft. On Monday morning I only managed about the first 20 minutes. When muscle spasms get to the point where you cannot get yourself out of the way of Tissier Sensei, who has come to demonstrate something with your partner, it’s time to get off the mat. So I watched again, and took some photos from the loft. That night I was doing much better (seems that shikko is the killer, for the moment), and was able to participate in both classes at my dojo. Like many vacations, it was great fun to get out, to see and learn new things, but wonderful to come home, too. All in all a tremendous experience, and I’m looking forward to next year! Set the alarm for oh-dark-hundred. Hit snooze about 6 times. Jump out of bed, soak food for the donkeys, eat. Shower, grab my stuff, and head to my home dojo (Aikido of San Diego). Participate in a 90-minute conference call from the dojo (was there alone), so that I could be there on time to train with Jean, who has her 5th kyu exam coming up next week. Train with Jean for an hour. Participate in the the first session of our new 8-week Low Impact class, which was really a nice experience. Hang around and chat after class. Mozy on home. Eat a banana and raw nuts on the way. Have a 90-minute massage, in an attempt to un-spasm my left calf and hamstrings, which seem hell-bent on preventing me from practicing suwariwaza. Have a hearty snack of nachos, grab a fresh gi, and run out the door. Forget my phone. Oh well. Get to the seminar with maybe 5 minutes to spare. Change, get on the mat, bow in. Have a fantastic time training. Get a few things easily, and totally miss a few others. Spot another friend every few minutes. Grab them to train with. Grab new people, too. Be glad the mat isn’t as crowded yet as it’s going to be tomorrow. Have a blast. Notice how time flies. Bow out, and circle up. Tell friends about a dozen times that I can’t go to dinner, I need to go home, feed donkeys, and get some sleep. Get convinced to go out for dinner anyway. Just really quick. Spend two delightful hours catching up on news, discussing teaching methods, considering breakfalls, and wondering what the nearby diners must have thought of our “animated” conversations. Drop a friend off at their hotel. Head home, start laundry, feed donkeys, write this blog post. 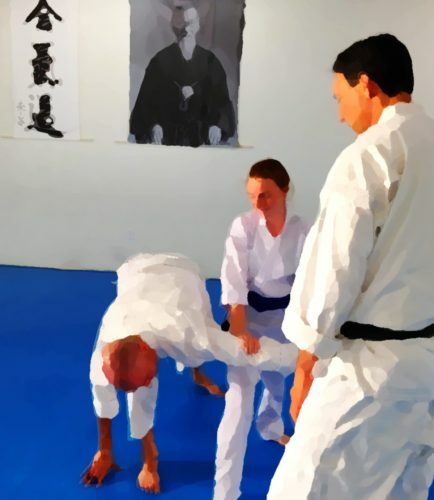 This is not specifically about Aikido, but what resonated with me was the life-changing potential in finding the right teacher, your teacher, in whatever it is that you do, and honoring your duty to pass the art along. Plus it’s a beautiful video. It’s about Michael Bell, master swordsmith of Dragonfly Forge and head instructor of Tomboyama Nihontō Tanren Dōjō (Dragonfly Mountain Japanese Sword Forging School). Enjoy. “Meanwhile, between now and your test (especially if you are getting stressed out), visualize the situation (dojo, Sensei, fellow students, etc. ), and practice being calm, happy, and deliberate. Worry/anxiety is just negative visualization – rehearsing in your mind all the things that could go wrong. When you catch yourself doing that, stop, take a breath, and rehearse in your mind everything going beautifully. :-) Breathe, smile, stand up straight and feel your feet rooted in the ground. Try on the feeling of saying, in your mind "For the next few minutes, this is my mat. Get ready, because you’re about to see an inspiring test!” :-) And be prepared, if anything during your test should throw you off momentarily (getting dizzy, doing a different technique from the one Sensei asked for, or whatever), to simply re-center, take a breath, and keep moving forward with your test, calmly. Just let it go (“Oh well. Next!”) and keep going.